I have been tinkering with a Tomato-Zucchini-Fennel Ragout recently. I made a large batch of this sauce several weeks back and froze a portion. Yesterday, wondering what to make for dinner, I pulled out the frozen ragout and made a casserole layering this sauce with brown rice grand shells from Tinkyada, chickpeas and navy beans, capers, and sliced kalamata olives. 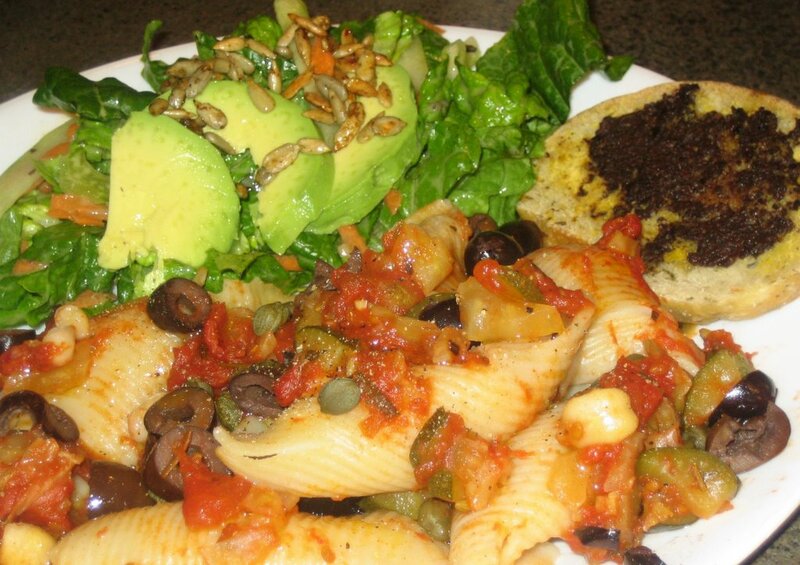 After baking, I drizzled the casserole with a touch of extra-virgin olive oil, and served with a salad topped with Roasty-Toasty Sunflower Seeds from Vive le Vegan!, and garlic bread spread with a prepared black olive tapenade. I was surprised that both my daughters loved the sunflower seeds. Sometimes children are picky with nuts and seeds, and my 14-month old has just started small amounts of seeds/seed butters (no nuts yet at this age). These sunflower seeds are roasted with toasted sesame oil, balsamic vinegar, and salt, and the girls loved the flavors! Yum! Will you share this recipe Dreena? I need to finalize the actual ragout recipe, and then I also have to set up my recipe page... so give me a week or so and I should have it set up! No problem Dreena. I'll wait patiently, as it looks delicious! Looks good. Just purchased Vive le Vegan recently, and I love it. I made the Pumpkin Seed-Crusted Lentil Patties, the Balsamic Flax Oil, and the Banana Oat Bundles. All delicious!